Ever since we became debt-free (except the house) and started traveling, Aruba has been on our list of places we’ve been dying to visit. In fact, we nearly settled on Aruba for our initial trip to the Caribbean but decided on the Dominican Republic instead. Even though we’ve now made almost 20 trips to the Caribbean and have visited about a dozen different islands, we’d still never made the trek to this “one happy island” – until now. This year, we finally decided to make our Aruba dreams come true! 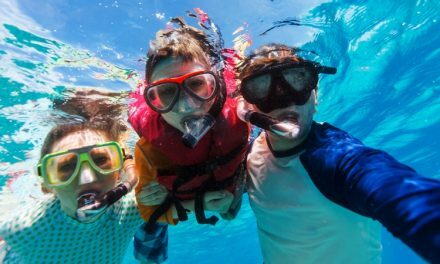 If you’ve followed our travels before, you already know that we love the value all-inclusive resorts provide when taking a beach vacay. 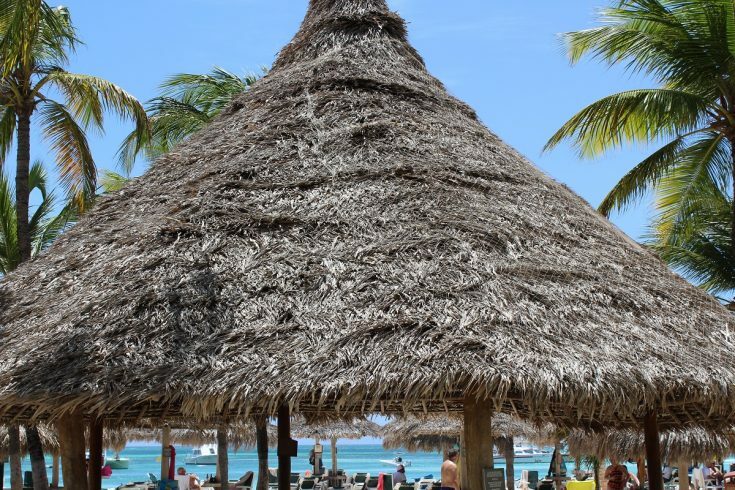 Since there are only a handful of all-inclusives available in Aruba, we quickly zeroed in on a few spots we wanted to stay. 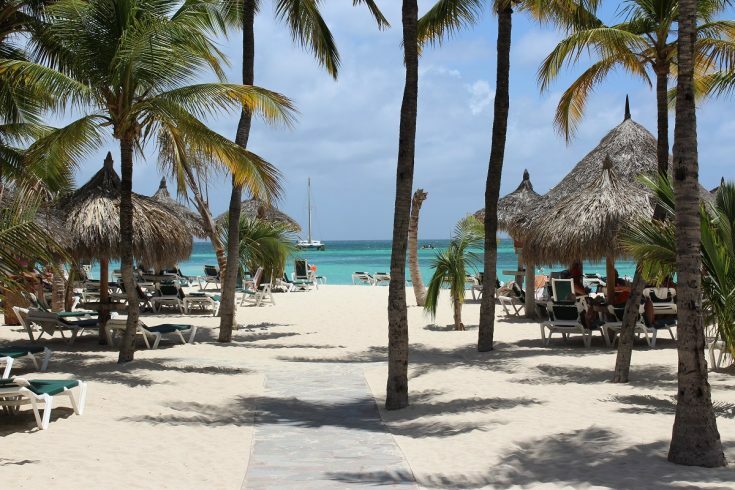 Ultimately, we chose the Barceló Aruba All-Inclusive Resort, and we were extremely happy we did. In this Barceló Aruba review, we’ll cover everything you need to know about this all-inclusive resort. From the beach to the nightlife, we’ve laid out our thoughts – and some of our photos – right here for you. I’m clearly not a professional photographer – Ha! – but I hope you enjoy it anyway! This was the first time that we had stayed in a Barceló brand hotel, and we were definitely pleased with the experience. Until recently, this hotel was actually an Occidental. 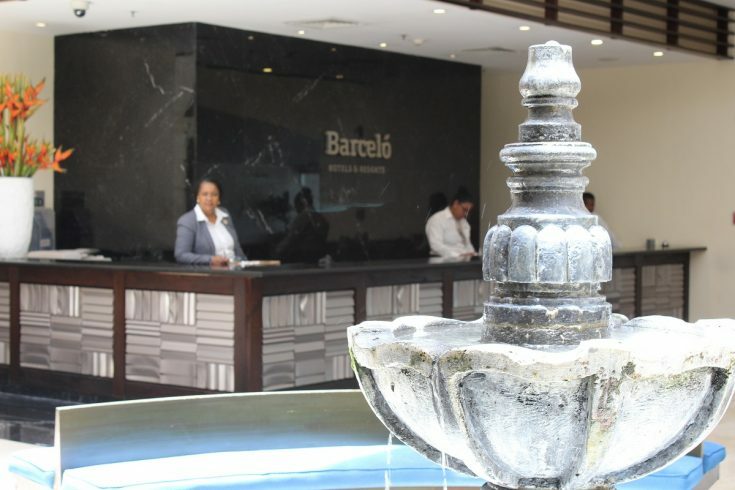 The transformation into a Barceló seems to have went smoothly, and you can tell the staff is proud of the new look and vibe. Speaking of the staff, everybody we encountered at the hotel was very friendly and helpful. (Heck, everybody on the island was, for that matter.) From the bartenders to the cleaning crews, the whole crew just wanted you to have a good time. The staff on the “Royal Level” was particularly friendly, and I can’t say enough about how well we were treated. Communication was never a problem as Arubans speak 4 different languages, including English. The hotel itself consists of two main towers and almost 400 rooms. The top three levels of the north tower are considered the “Royal Level” which comes with a few extra perks. (More on that in a bit.) There is an on-site wedding coordination team as well as space for meetings. Of course, there is also a gym and spa area for those who want to partake. The rooms at the Barceló Aruba are nice, and prices are on-par with what I’d expect from an all-inclusive hotel of this caliber. Rooms can generally accommodate up to 4 people, although most of the adults-only Royal Level rooms are restricted to only 2 guests. While the Royal Level rooms cost slightly more, the rooms themselves are essentially the same. However, Royal Level guests do have access to some additional amenities, including a special restaurant, a Royal Level only beach bar, Royal Level check-in/check-out, and special concierge services. 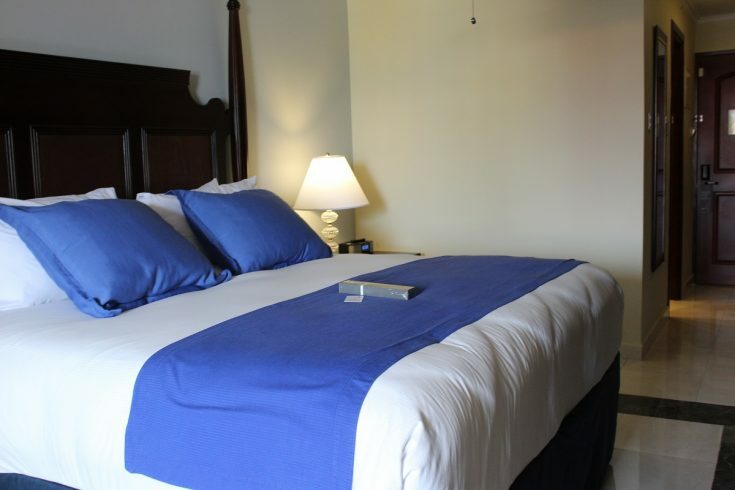 All rooms are equipped with the regular amenities like a TV, air conditioning, a shower, and a safe. Everything in the mini fridge is included in your room rate, and it’s stocked daily with a few beers and water. Because this is an all-inclusive resort, room service is also included. While the hotel is very nice, for me, the beach is definitely the star of this place. Quite frankly, this stretch of beach is one of the most beautiful I’ve seen. The sand is as sugary as any you’ll find anywhere in the world. Additionally, the color of the water is so turquoise that it almost looks fake. This stunning blue sea is so calm and clear that you can see the bottom, even when you’re up to your neck – at least until some of the boats and jetskis churn it up later in the day. The sun gets very hot, but there are plenty of spots for you to grab some shade. Some of my favorite features from this resort are the dozens of palapas the hotel provides along their stretch of the beach. They even have gigantic palapas that seat like 30 chairs underneath them. So, if you can’t find a private one for yourself, there’s still plenty of shade to be had. Honestly, I can’t wait to go back. To be honest, we didn’t spend a ton of time at the pool. (We’re more beach bums.) However, the pool was very nice, and there was always a lot of activity happening here. As you can see in the photo, the pool is pretty big. The main swim-up bar is located there, and it sees a lot of action from pool goers and beach peeps alike. If you’re looking for a good time, you can almost always find a crowd having fun or playing pool volleyball here. For those wanting a bit more quiet space, I’d suggest grabbing a chair under one of the palapas on the beach. We tried two of the sit-down dinner restaurants, and – again – I thought they were good. Kyoto is a Japanese themed restaurant offering hibachi or sushi. L’Olio is the hotel’s take on Italian cuisine. While my seafood pasta didn’t compare to my favorite dishes in Venice, the meal was good and the service was excellent. Although we didn’t try the Mexican-style restaurant, I heard several guests raving about it. 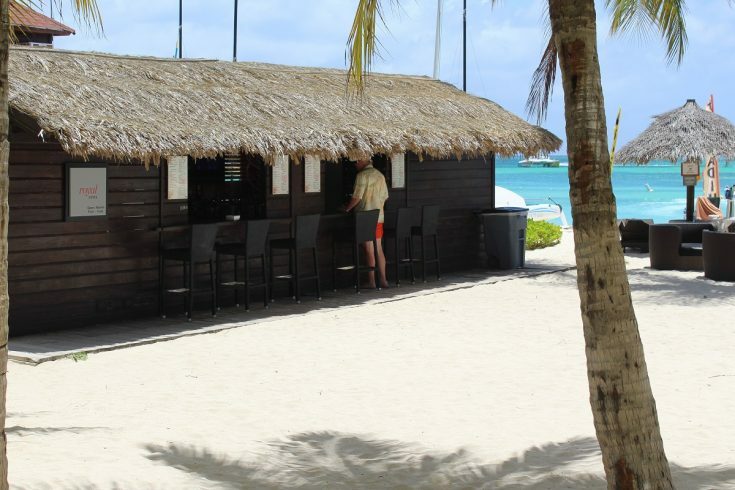 A Note for Veggie Lovers: Even though it is located in the Caribbean Sea, Aruba is actually a desert. 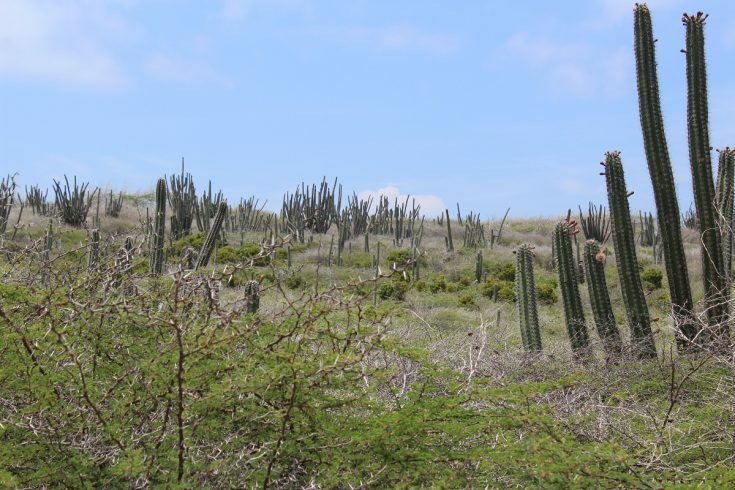 Once you get off the beach, huge cacti provide a really unique landscape throughout the island – especially for the Caribbean. However, I think the lack of rainwater and edible vegetation contributes to Aruba being a little less veggie friendly than some other islands. If you are pescatarian, you’ll find plenty to eat on the island. However, if you are a strict vegetarian or vegan, things could get a little tough for you – especially if you’re looking for more than a salad at every meal. This is an issue across the entire island, not just this hotel. One of the perks of staying on the Royal Level is that you have access to a special restaurant that’s reserved exclusively for Royal Club members. We ate all of our breakfasts here and dined here for lunch twice. (They also serve dinner, but we did not dine there in the evening.) 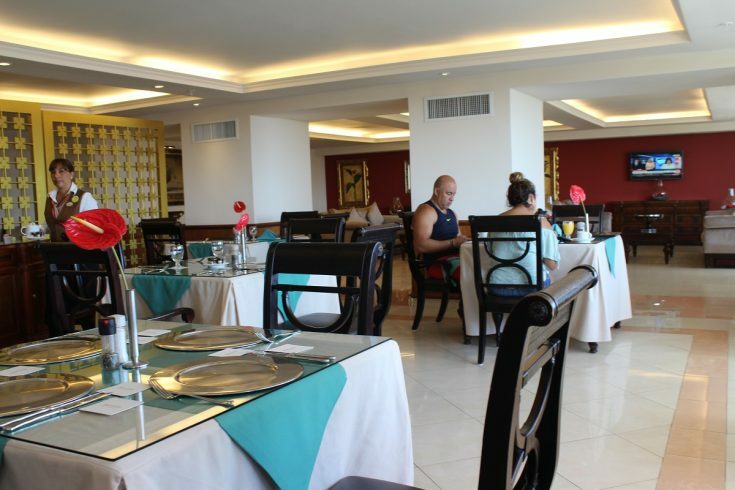 The food was delicious, especially for an all-inclusive, and the service here was exceptional. 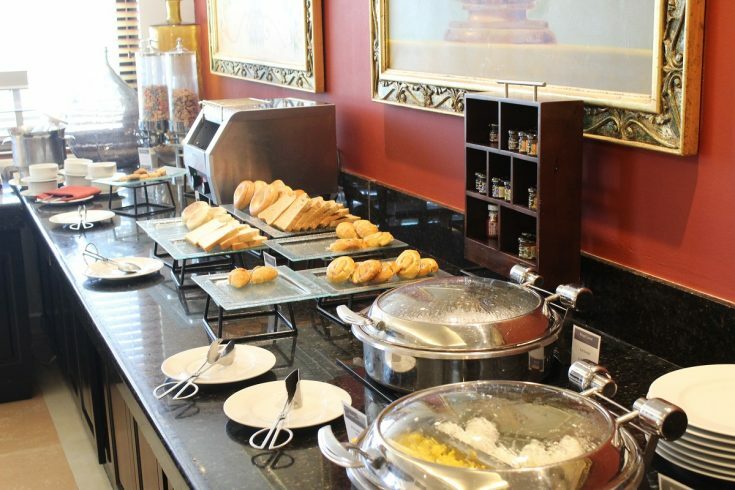 Breakfast consists of both a menu and a buffet, while lunch is served only from the menu. My only complaint is that the menu in the Royal Level doesn’t seem to change each day. While there are plenty of meat options, if you’re a pescatarian like me, I can see where eating the same two fish dishes could get old. With that said, what I had was wonderful! A Few Dining Tips: From what we were told, the hotel guarantees three reservations at their a la carte restaurants for a week-long stay. As with most all-inclusives, these restaurants have a dress code in the evening. Men should bring a pair of pants, collared shirt, and closed-toe shoes. Ladies can get by with a skirt, dress, or pants. If you’re looking for nighttime activity, the Barceló Aruba is the perfect location to stay. The hotel itself has plenty of things going on during the evening, including a nightly stage show and live music in the lobby area. 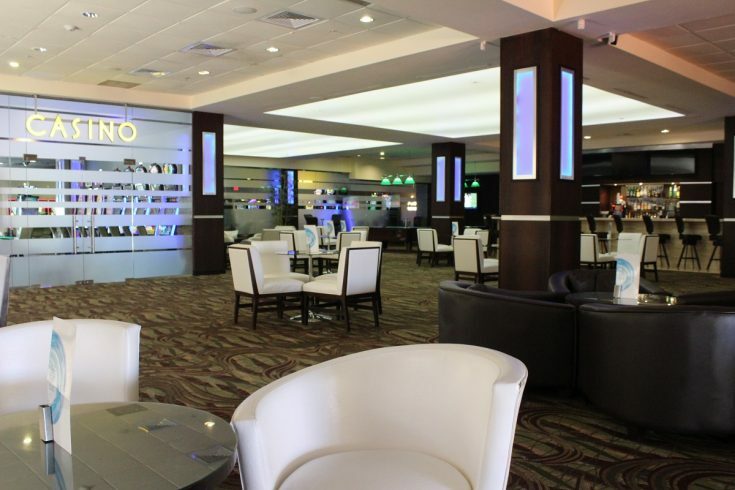 However, one of the biggest benefits of staying at the Barceló is that it’s located right in the middle of the main strip, with dozens of restaurants, bars, and nightclubs located just across the street. The vibe is totally happening out there, and it seems very safe. I’d highly suggest checking it out for at least one of your nights there. To be perfectly honest, Aruba stole our hearts. The people were welcoming, the island was incredible, and Aruba is home to some of the most beautiful beaches I’ve ever seen. I can’t wait to go back. As for the hotel, we will definitely be staying here again. 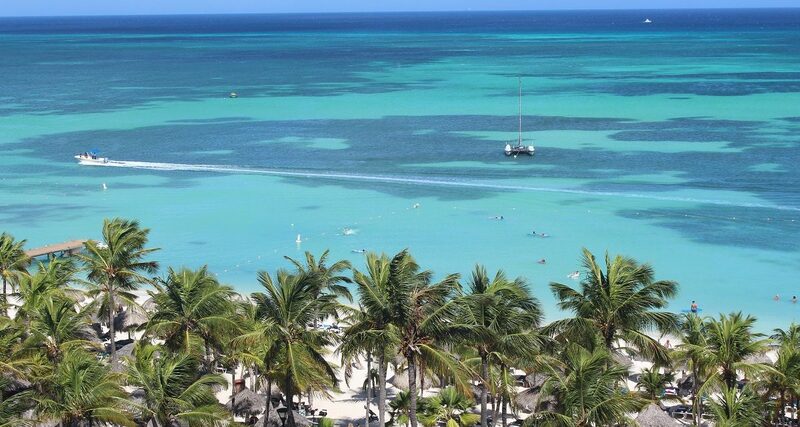 If you enjoy all-inclusive resorts, the Barceló Aruba is the perfect choice for your Aruban vacation. The food is good, the service is excellent, and the resort’s location in the middle of the strip can’t be beat. 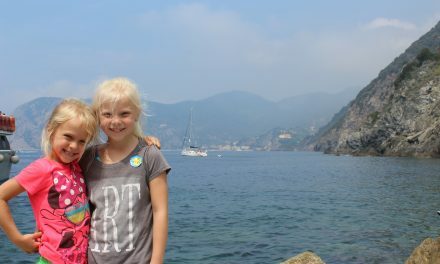 Room prices are reasonable and provide a very good value for your vacation dollar. Above all, you’ll not find a more beautiful stretch of beach in front of any hotel on the island. If you’re going to Aruba and considering an all-inclusive resort, I’d highly recommend the Barceló Aruba. 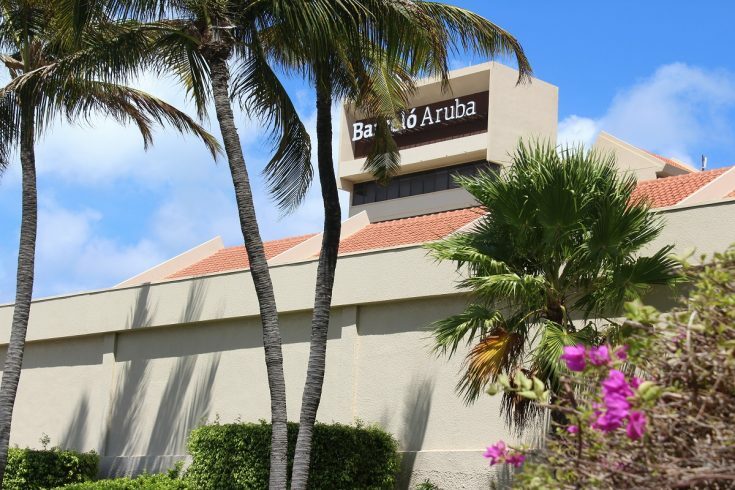 Find the Barceló Aruba’s current room rates here. 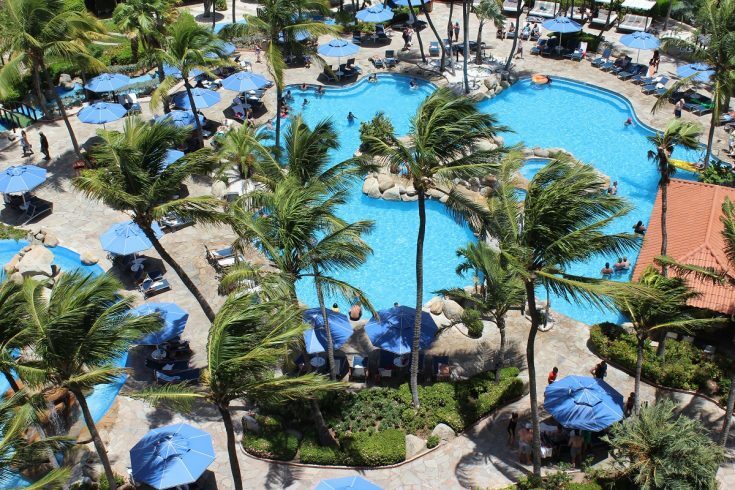 I hope you’ve enjoyed our review of the Barceló Aruba! As always, please let me know if you have any questions in the comments below. Until next time, happy traveling! NextWant to Retire Early? Here’s How We’re Doing It. We stayed at Barceló Maya Palace in Riviera Maya a few years back for my parents’ 40th wedding anniversary trip. 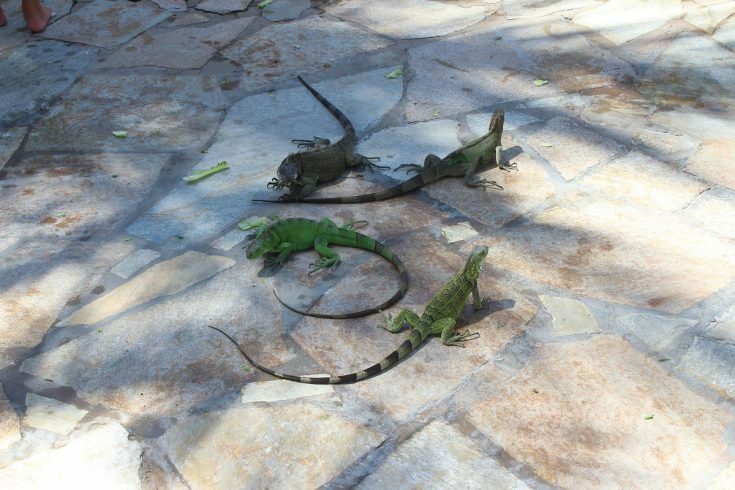 It was awesome – good to hear you guys had a good trip to Aruba! We are going to Aruba Barcelona April 2019. We booked all inclusive through RCI is this considered the Royal Level as well? If not how do we upgrade and what is the cost? Hey Cheryl, the timeshare portion of the hotel is a bit different from the rest of the property. You’ll have to contact them to see what type of amenities are available on that side.